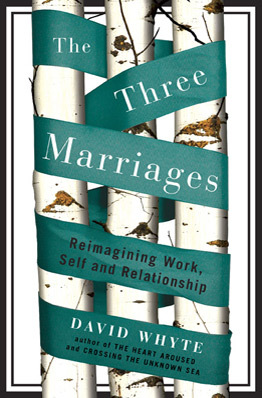 Few books I’ve read contain more marked passages and pages than David Whyte’s passionate and thought-provoking book, The Three Marriages: Reimagining Work, Self and Relationship, which argues we should stop thinking in terms of work-life balance. The current understanding of work-life balance is too simplistic. People find it hard to balance work with family, family with self, because it might not be a question of balance. Some other dynamic is in play, something to do with a very human attempt at happiness that does not quantify different parts of life and then set them against one another. We are collectively exhausted because of our inability to hold competing parts of ourselves together in a more integrated way. Interestingly, we belong to life as much through our sense that it is all impossible, as we do through the sense that we will accomplish everything we have set out to do. This sense of belonging and not belonging is lived out by most people through three principal dynamics: first, through relationship to other people and other living things (particularly and very personally, to one other living, breathing person in relationship or marriage); second, through work; and third, through an understanding of what it means to be themselves, discrete individuals alive and seemingly separate from everyone and everything else. These three lifelong pursuits, Whyte believes, “involve vows made either consciously or unconsciously.” Neglecting any one of these “impoverishes them all” because they are not mutually distinct but rather “different expressions of the way each individual belongs to the world.” Our flirtation with each differs and yet we are left to inter-weave the vows into a cohesive person, consciously or unconsciously. We should stop thinking in terms of work-life balance. Work-life balance is a concept that has us simply lashing ourselves on the back and working too hard in each of the three commitments. In the ensuing exhaustion we ultimately give up on one or more of them to gain an easier life. … [E]ach of these marriages is, at its heart, nonnegotiable; that we should give up the attempt to balance one marriage against another, of, for instance, taking away from work to give more time to a partner, or vice versa, and start thinking of each marriage conversing with, questioning or emboldening the other two. … (once we understand they are not negotiable) we can start to realign our understanding and our efforts away from trading and bartering parts of ourselves as if they were salable commodities and more toward finding a central conversation that can hold all of these three marriages together. Perhaps this resonates with me more than most because I’ve always found the argument that we should live a balanced life lacking. At its heart this implies we should trade one aspect for another, compromising as we go. To me this trimming of excess in one area to prop up another serves to remove, not create, meaning. The other argument that Whyte surfaces penetrates the fabric of our human needs: the constant tug of war between our social desires and our need for space. This is another area where we naturally try to find balance and in so doing compromise part of ourselves.